Kelly’s Directory 1881 tells us that at 52 Holland street lived Mr Thomas Sweeting, an undertaker. The Sweeting family were probably one of the most well known in the area for two reasons. 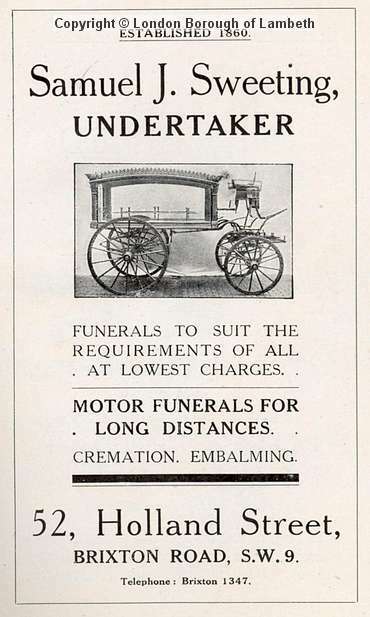 Firstly their profession was that of undertakers and secondly they owned their business in Holland street from at least 1861 to 1928, that’s almost seventy years. See below for all census entries for the Sweeting’s family business, you will see how it was handed down from Thomas Sweeting on his death to his son Samuel Sweeting who like his father, was in charge of the business for many years.